Who needs 3D Wave Acoustic Wall Panels? If you find that you get bombarded with background noise when you're trying to work, these panels help you create a more sound-proofed office space that helps you focus. Shared offices, media rooms, and almost any space could do with more sound insulation! How many panels can I install on my wall? As many as you have room for! Panels are 23.75" square, so if you do a little basic math you can figure out how many you can fit on your wall. Or use a single panel to reduce a few decibels in your immediate work area. How does this install to my wall? These panels are very easy to install and you have a couple of options for how to do it. The simplest way is to just set your panels on some hanging nails. The panels are recessed in the back, and will hang securely on the wall. Some optional add-ons include clips, adhesive tape, and velcro strips. For a look at all the installation options you have available, check out our assembly instructions. 3D Wave Acoustic Wall Panels boast a Noise Reduction Coefficient of .8. In layman's terms, this means that 80% of sound that reaches the panels is absorbed. 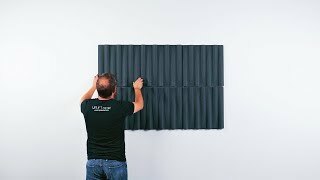 In Acoustics, zero absorption is 0 and perfect absorption is 1, so these panels will successfully reduce much of the background noise in your space. Make waves in your office with the 3D Wave Acoustic Wall Panel, available in Lagoon Blue or Dark Gray. This sculptured wall panel adds visual interest to any wall while also dampening ambient noise. Add one panel to your wall, or as many as could possibly fit! You can even mix and match colors and the direction of the panels for a one-of-a-kind wall display.